Take a hacksaw blade and break a little bit off. 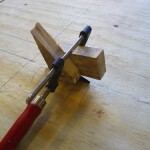 Fix this between two pieces of wood and apply pressure with a clamp until the blade bit is fixed tight. Go to phase 2. 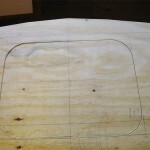 Use the composite tool to scratch a slit into the hatch outline. Remember to pull the way which the teeth cut. 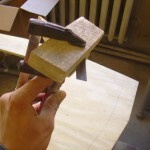 Usually hacksaw blades are unidirectional. Only cut with the composite tool until you have a slit wide enough to fit your jigsaw blade trough it. Then cut the hatch out. This is what the end product should look like. Nice and tightly cut.